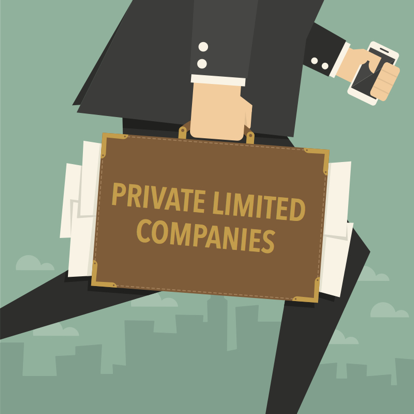 Private limited companies are a legal entity with which you can run your business. As such, they need to be registered at Companies House and are subject to rules for annual filings and paying taxes. A private limited company is a type of organisation you can set up to run your business. Company ownership is split into shares owned by shareholders. A company must pay corporation tax out of any profits and can then distribute the remaining profits among shareholders. It’s run by directors who are legally required to perform certain duties for the company and its shareholders. 'Limited' means that the financial responsibility of the company is limited to the value of the company’s shares that have not been paid for. This means that if a company has one member (shareholder) and they own 20,000 shares each at a value of £1, then they would be liable for £20,000 (if unpaid) at the time of winding up. What does 'limited liability' mean? The basis of a limited liability company is that all debts incurred by a company are the company's liabilities and are not directly the legal liabilities of the company's shareholders or directors. The directors of a limited liability company do not incur personal liability as all their acts are undertaken as agents for the company. However, liability may be imposed to directors in the event of wrongful or fraudulent trading, ie if a director acts in an inappropriate manner (eg using fraudulent methods to pay creditors, overpaying themselves, using company funds for their personal benefit, etc.). NB: those who undertake director's roles without being legally registered at Companies House are considered ''de facto directors'' and are usually treated by the law in the same way as registered directors. A de facto director is an individual who carries out all the duties of and makes decisions as a director without being formally appointed as such. Choose a company name and register the company with Companies House. Read How to register your company in 5 steps for more information. A company must pay corporation tax, and file an annual Company Tax Return. New companies: 21 months after incorporation. Download HMRC’s detailed guidance on Submitting your Company Tax return. The company must register for VAT if it expects turnover to be more than the current threshold. Companies House requires you to keep and maintain statutory books of your company at either your company’s registered office or another place where they can be inspected. You must maintain accurate accounting records, which contain details of payments made and received as well as the assets and liabilities of the company. You must keep them for three years from the date they were made. From 6 April 2016, you must start keeping a register of people with significant control (‘PSC’). This new register must contain information on individuals who ultimately own or control more than 25% of a company’s shares or voting rights, or who otherwise exercise control over the company and its management. A company’s PSC register will be available for public inspection and will be searchable online via Companies House. From 30 June 2016, you must start including PSC details when filing your new annual confirmation statements (which will replace the current annual return from the same date). Read general guidance on the PSC regime for more information. In June 2016, confirmation statements replaced annual returns. A confirmation statement is a snapshot of general information about a company's directors, secretary (where one has been appointed), registered office address, shareholders, share capital and people with significant control. Confirmation Statements can be made at any time, although no more than 12 months must elapse between them. Companies House will not impose any financial penalties if your confirmation statement is delivered after the filing deadline, however, your company could be struck off the register (i.e. closed down) if you simply do not send one at all. For more information, you can read guidance on the confirmation statement. You must also file a set of accounts at Companies House each year. Once the accounts have been signed off by the directors and a copy has been sent to the company’s members, you must file them with Companies House. Existing companies must file the accounts within nine months of each accounting reference date. New companies must file your first set of accounts within 21 months of the incorporation date. HMRC may wish to inspect your business records to ensure that the business is paying sufficient tax, staff are being paid appropriate wages, and National Insurance contributions are being properly made. They will also want to check that the business is not being used for money laundering purposes. Read Accounting and bookkeeping for more information. There are certain other ‘event driven notices’ that have to be submitted to Companies House to update their records. If, for example, a company changes address or appoints a new director Companies House has to be informed. Read Other filings at Companies House for more information. Read PAYE and payroll for more information. If the dividend income of any directors and/or shareholders from dividends might exceed £10,000 then those directors and/or shareholders will need to register for a self-assessment tax-return using form SA1.